The American Sign Museum promotes sign preservation and restoration by displaying nearly 100 years of signage. We preserve and protect American history and pay homage to the artistry and craftsmanship of days gone by. Our collection honors an often overlooked part of our culture that hides in plain sight as part of our daily lives. Tod Swormstedt spent 26 years on the staff of Signs of the Times magazine, which was founded in 1906. He became the fourth-generation editor of the "bible of the sign industry," following in his family's footsteps. Tod parlayed all of his knowledge and contacts into a self-proclaimed “mid-life crisis project" that would eventually become the American Sign Museum. This was Tod's chance to preserve the 3-D craftsmanship of multi-generational sign companies, to tell their stories and bring these signs to life before they were lost forever. In 1999, Tod founded the National Signs of the Times Museum. With accelerating support, the museum was renamed and re-opened as the American Sign Museum in May 2005. Its temporary home within an arts center sufficed for several years, but growing pains ensued. The magnificent McDonald's and Holiday Inn signs couldn't be displayed to their full heights, and the collection was growing rapidly. Tod began searching for a more permanent home for the ever-expanding collection. He needed a space that could fulfill his vision for an interactive museum experience. He found the ASM's new home in Camp Washington, an appropriately historic area of Cincinnati. The century-old Oesterlein Machine Company-Fashion Frocks, Inc. Complex became the ASM's new home. Its doors opened in June 2012. The American Sign Museum's expansion has continued unabated. New acquisitions arrived weekly, and the 20,000 square feet of museum space quickly filled. In October 2016, the roof in the annex of the building was replaced, which allowed for a future doubling of the museum's size. To celebrate the rich history of American signage through preservation and education. The American Sign Museum is the premier institution for preserving historic signs and promoting the contributions the sign industry makes to commerce, culture, and the American landscape. Neonworks of Cincinnati is Cincinnati's only full-time neon sign shop! They create custom signs for commercial and residential use, and are located right inside of our building! 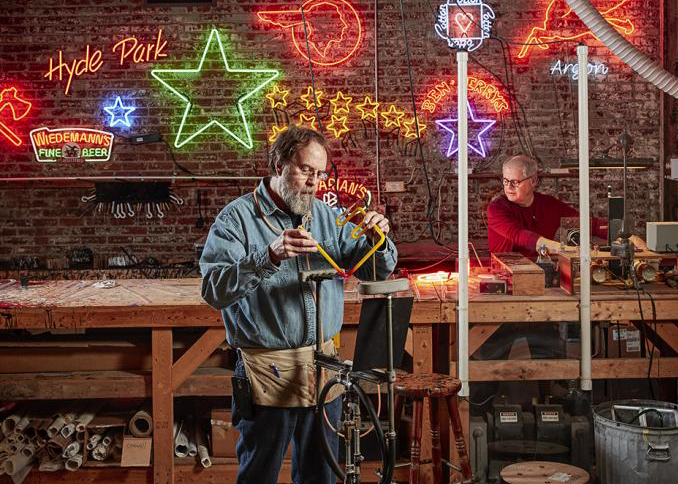 Come watch one of the skilled craftsman create or repair neon signs during one of our weekday tours. Neon tube bending is one of the few crafts that can't be replicated with automation! Interested in getting a custom sign for commercial or residential use? They do that, too! Contact them at 513-771-8559 to find out more. Our weekday guided tours typically end with a 15-20 minute demonstration inside of Neonworks!